After the ARP poisoning tutorial, the victim ARP cache has been changed to force the connections from the Windows machine to go trough the Ettercap machine to reach the desired destination. As the trap is set, we are now ready to perform "man in the middle" attacks, in other words to modify or filter the packets coming from or going to the victim. To launch attacks, you can either use an Ettercap plugin or load a filter created by yourself. We will use here the Ettercap plugin called dns_spoof to test a very famous attack, the DNS spoofing where the pirate answers DNS requests at the place of the DNS server. When you access your favourite web site with your browser, your machine (it has an IP address of 192.168.1.2 in our case study) will first ask the DNS server for the IP address matching your URL and then the browser will display the web page. With DNS spoofing, when the DNS request is sent, the spoofer answers at the place of the DNS server and provides another IP address. The consequences will be that you have the feeling to reach the desired web site but this will be in fact the pirate's website because of the different IP address. The attack can very dangerous when the pirate spoofs important websites such as your bank website. His/Her fake web server will have exactly the same interface than the real bank web site. So, the pirate will wait for you to enter your credentials on his website to capture them. Let's proceed with the DNS spoofing attack. 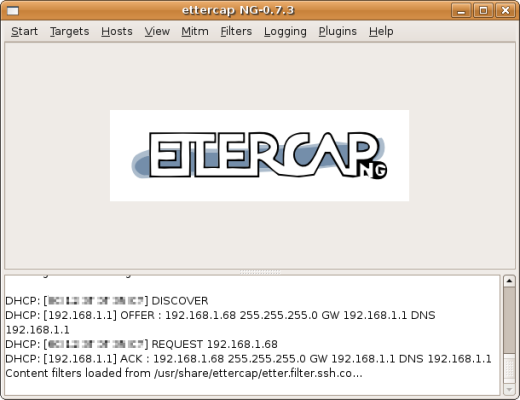 The first thing to do is to set the configuration file called etter.dns in the /usr/share/ettercap/ directory. In the file you can find an explanation about its configuration. Here is the content of our etter.dns file. It means that when you open www.linux1.org in your web browser, you will see the content of the www.linux.org website. To start the DNS spoofing, you need to activate the dns_spoof plugin in the Ettercap graphical interface. Remember that you need to follow the ARP poisoning tutorial before doing the steps below. Click on the dns_spoof line to activate the plugin. This will tag the line with a star. Then enter www.linux1.org in a web browser. You can see that the content of the page opened is the one that matches the IP address you added in the etter.dns file and not the real IP address matching the www.linux1.org address. On an Ubuntu machine use the following command: "/etc/init.d/dns-clean start"
If you want to change the default DNS cache time, you have to modify an entry in the Windows registry. Be careful when playing with the registry, an incorrect configuration can damage your system and prevent it from rebooting. click on the "Decimal" button and finally enter your new value for the DNS cache time. The filters allow you to change the content of packets. To create a filter, a configuration file must be compiled before being able to be used as a filter. You can find some predefined examples in the /usr/share/ettercap/ directory. We will study two examples based on Ettercap filters. We chose in our simple example to change the prompt of a FTP connection. Below is our configuration file called test_filter in the /usr/share/ettercap directory. Then you need to compile the file with etterfilter because Ettercap can only load compiled files. 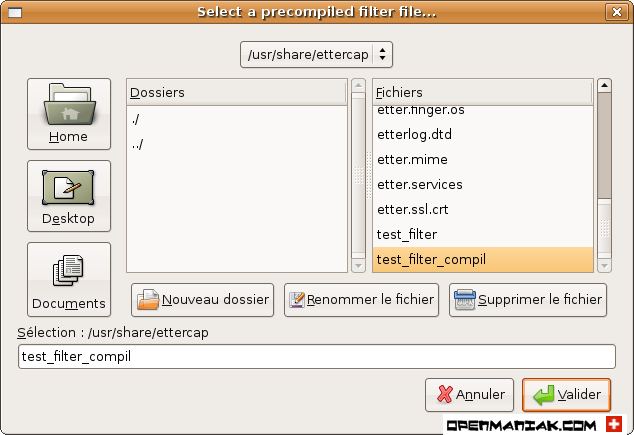 This will create a compiled file called etter_filter_comp. Now, it's time to test a FTP connection with our client machine 192.168.1.2. 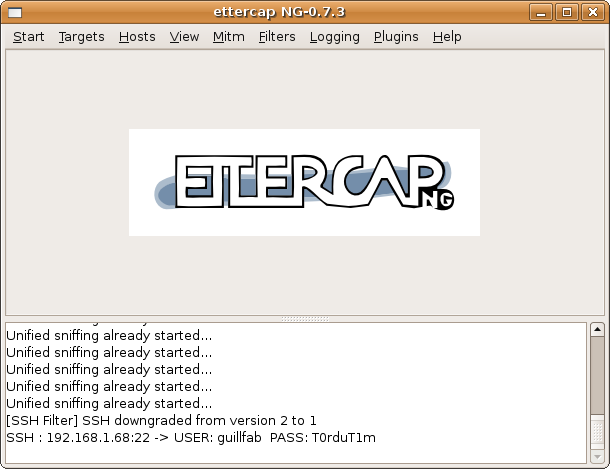 Tests are performed before and after the Ettercap filtering. "xyz" is the website name and "1.2.3.4" an IP address. A particularly crafty attack called "the downgrade attack" can be used once in "the man in the middle" position. The principle is to downgrade a protocol version by changing data inside packets, to another version known to be vulnerable. SSH is the most famous example of a downgrade attack where the attacker forces the client and the server to use the insecure SSH1 protocol. The client sends a request to establish a SSH link to the server and asks it for the version it supports. In our example, the server is configured to support both SSH1 and SSH2 and the client is set to use SSH2 and SSH1 but SSH2 as a preference. Suppose the server is configured for SSHv1 and SSHv2, the hacker will change the answer by modifying the "1.99" string to "1.51" to indicate to the client that the server supports only SSH1 and thus forces the client to open a SSH1 link. The client who thinks to use the secure SSH2 protocol will login with SSH1 and the password will be immediately captured by the hacker because of the SSH1 weak password authentication mechanism. b. SSH client: Putty on Windows. Disabling protocol version 1. Could not load host key. #ssh-keygen -t rsa1 -f /etc/ssh/ssh_host_key -N ""
Download the Putty client. Putty is a well known open source SSH client for windows. Keep the SSH default Putty configuration. SSH1 and SSH2 are accepted but SSH2 preferred. 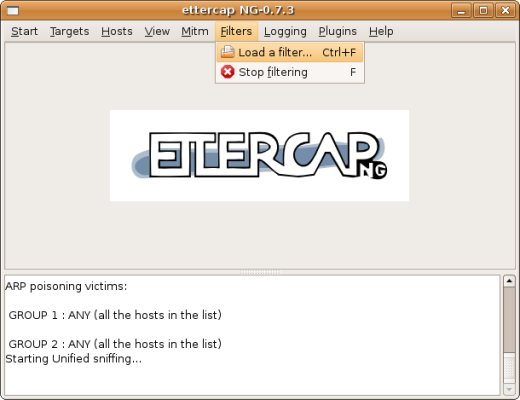 Follow the Ettercap installation tutorial to install Ettercap and the ARP poisoning tutorial to set our machine as "Man in the Middle". Ettercap offers a predefined configuration file for the SSH downgrade attack. The file is /usr/share/ettercap/etter_filter_ssh. We can check the content of the file but nothing has to be modified. We just need to compile the file to create the filter. We are now ready to load the filter. The filter is now loaded. We are ready to open an SSH link from the client. The client, the hacker and the server machines are now configured correctly. We can test opening an SSH link from the Putty client. Open Putty, on the left, click on "Session", then enter the SSH server IP address (192.168.1.68 in our example) and check the "SSH" radio button. Click on the "Open" button to connect to the SSH server. It's time to see if everything is working fine and check on the hacker machine if we catch the SSH1 password. 1. The server (192.168.1.68) sends a "1.99" answer to the client (192.168.1.132) meaning it supports SSH1 and SSH2. 2. The client establishes an SSH1 link because the "1.99" server answer was changed to "1.51" by the hacker. How to avoid SSH downgrade attacks ? SSH1 must NEVER be used on a SSH server and SSH2 forced on the client. By default, only SSHv2 is enabled on the OpenSSH server while it is frequent to see SSHv1 and SSHv2 enabled on the clients such as Putty. Open the /etc/ssh/sshd_config file and check that only the SSH2 protocol is enabled. If you make a change, restart the server with "#/etc/init.d/ssh restart". The value in red must not be under 2.0. Force the SSH2 protocol on the client. 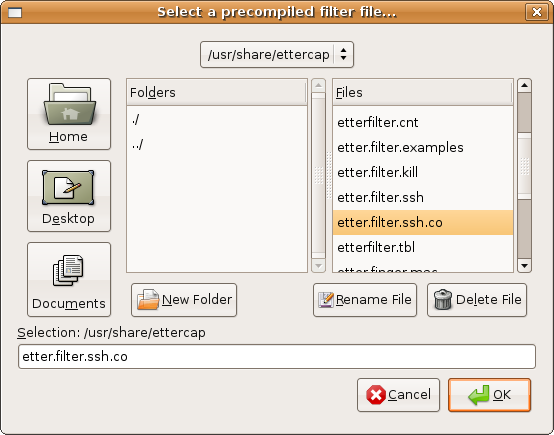 On Putty, in the left panel, click on "Connection" then "SSH". Finally, check the "2only" radio button. As a general security rule, try always not to use the default settings, but to force the security level as high as possible both on a server AND its clients.